Occasional Brief Observations: Greatest Olympian? What this blogger doesn't understand though, is the need of so many people to boil it all down to "the best athlete in the world." Why can't we just marvel at this amazing performance in a particular sport, without making it a competition with other Olympic sports, athletes present and past, and other non-Olympic sports events? 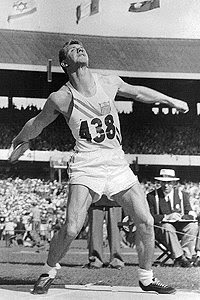 Discus: Al Oerter won gold medals in four consecutive Olympic games in the discus (1956 to 1968). A week before the 1964 Tokyo games Oerter slipped on wet concrete, tearing cartilage in his rib cage. Although team doctors told him to forget the Olympics, Orter’s reply was "You die before you quit" He went on to win gold. Each gold also set an Olympic record, he had four world records (1962–64), and was the first to ever throw the discus more than 200 feet. Rowing: Sir Steve Redgrave won gold in rowing events in five different Olympic Games (1984 to 2000), along with an Olympic bronze. Thrown in 9 gold medals, 2 silvers, and a bronze at the Rowing World Championships…. Wrestling: Alexander Karelin won gold medals in three consecutive Olympics (1988, 1992, and 1996) and silver in 2000, while going undefeated in international competition from 1987 until 2000. Prior to losing the gold medal match to Rulon Gardner at the 2000 Summer Olympics, Karelin went the last six years of his unbeaten streak without giving up a point. 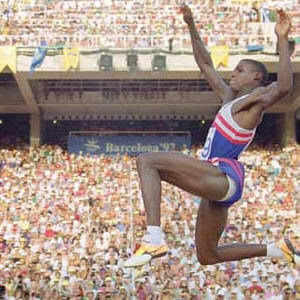 Track and Field: Carl Lewis won nine gold medals and one silver across four Olympic Games… Throw in ten World Championship medals (eight golds); 65 consecutive victories in the long jump achieved over a span of 10 years (one of the sport’s longest undefeated streaks); and an indoor long jump world record that has stood since 1984. And how do you compare Phelp's performance to the Tour de France? The Tour lasts 23 days, consists of 21 daily stages with just 2 rest days (10 “flat” stages, 5 mountain stages, 4 medium mountain stages, and 2 time trials)... Twenty teams each of nine riders compete for a total distance of 3,000.5 kilometers, (winning time: 87 hours 52 minutes and 52 seconds!). Answer: You don't! (and it was a silly thing for his team mate to say!) 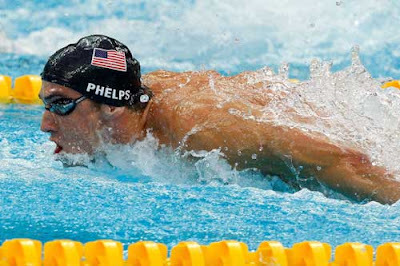 Apples and oranges, this blogger salutes them all - Michael Phelps, Olympic champions past and present, Tour riders, all those who pull off these remarkable feats of physical prowess and endurance to the cheers of the armchair spectators (this blogger included! ).